For the second time, in one year, a group of 40 faculty and students of Calpoly Orfalea College of Business were on their ‘International Business Tour’ to China and India. They visited the MET League of Colleges (Mumbai). 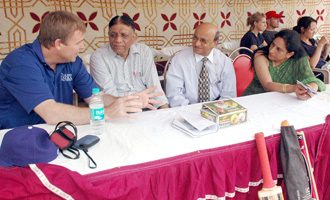 The group was spearheaded by Dr. Chriss Carr, the Business Associate Dean and Faculty Development In-charge at Calpoly. Dr. Jay Singh, MS and Ph.D. in Packaging Science from Michigan State University, a Professor at Calpoly and Head of Research projects also lead the group. Ms Neetu Bali was the group coordinator who accompanied them.